If you can think of it, Vegas probably has it! Keep in mind some of these require you to be sober in order to take part. Mandalay Bay Shark Reef – Located in the south end of the resort, the reef is very large are can take an hour plus to get through. There is a touch pool for sting rays and tanks that surround you. If you use the MyVegas app there is 2 for 1 passes available. NYNY The Big Apple Coaster – Ride the roller coaster that goes outside and around the Statue of Liberty and the Brooklyn Bridge! This roller coaster is one of the roughest ones I have ever been on. The ride leaves you with a bit of a headache after. That said it still worth trying once! Bellagio Fountains – Located in the giant lake in front of the Bellagio hotel and across the street from the iconic Effie Tower. The fountains dance to music. Showtimes start as early as 11:00 and run every 30 minutes until 8 PM, then every 15 minutes till midnight. They are amazing to watch and FREE! Enjoy! Now if you are a true high roller you can pay $250,000! and get the ability to choose a song and press the red button to start them on your demand! 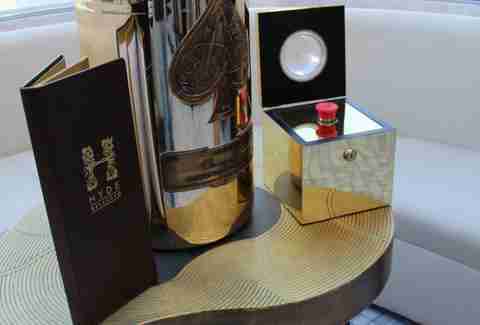 It also comes with a massive bottle of Jay Z’s Ace of Spades champagne. High Roller – The worlds tallest observation wheel! Located between The Linq and The Flamingo resorts. It takes 30 minutes to do one full rotation. I highly recommend waiting till dark when you get the nice views. What makes this such a great attraction is the happy half hour! You must be 21+ and it includes a open bar inside the cabin. The bartenders are very efficient and are stocked with premium alcohols and some beer. I have done this now 3 times and you can get roughly 4 to 5 drinks down and take one for the road as well. When it is only an extra $13.00 during the day and $15.00 at night, it makes for an amazing experience! Stratosphere Tower / Rides – Located at the very North end of The Strip. The views from the top of the tower are second to the High Roller. The nice thing is you get to stay until close, so take in the views! If you have an extreme side, you can try the rides at the top. There are 4 total, one shoots you into the air, one throws you over the edge, one rotates you over the edge and the other lets you jump of the top! ReVIV – Want that cure for that massive hangover? Get your system flushed with IV fluid and re-hydrate yourself. Get hooked up by a EMT and sit in a massage chair or watch Netflix. The whole process takes 1-1.5 hours. Machine Gun Experience – Ever want to shoot a AK-47, MP5, M4 or a Saw machine gun? These guys are very friendly and offer a great experience for anyone who has or hasn’t already shot firearms. They also offer free shuttle service! Check out Machine Gun Vegas if you wanna try a Barrett .50cal or fire a Saw from a helicopter!! 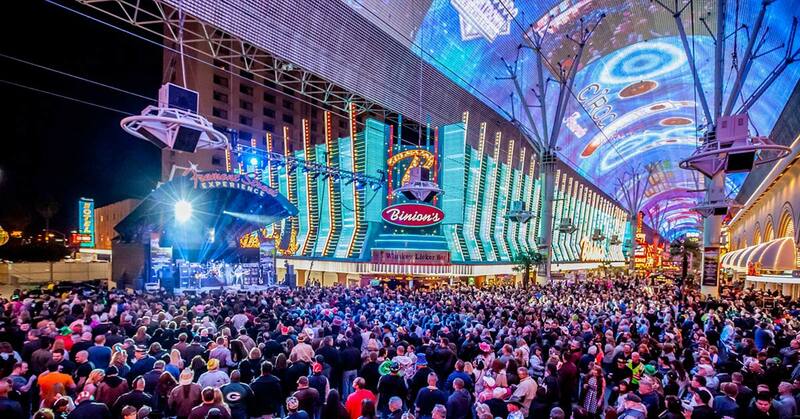 Fremont Street Experience – The old strip! Here you will find the historic Golden Nugget and the Golden Gate. There is free concerts playing all the time. You never know who you might see (naked cowboys, showgirls). While there try the SlotZilla zip line or check out the Heart Attack Grill! Every hour on the tour be sure to step out of the casinos and look up! The massive screen puts on a show for all to see! If there is anything you have tried that isn’t on this list let me know! I always look for new things to try when I am in Vegas!